As I said on my article about doing an advocacy blog, I am not into blogging for “making money online (MMO)” or “blogging for money” activity but I would be an hypocrite if I say I will not be happy if I get some side income doing it. And yes, after more than one (1) year and four (4) months, I received my first payment from Google Adsense. It took a long time because as I said monetizing this site is not my priority. I know I should be using keywords with high PPC (pay per click) on my posts but I do not do that. In the course of my learning how to blog, I had come across and even tried PPB (pay per blog), affiliate marketing and the like and made small income but decided not to pursue them because I concluded that doing so may derail my blogging for advocacy. Herewith is the proof of the payment I received from Google Adsense. My purpose in posting it is not to brag nor celebrate the feat. I know that many bloggers make much more than I do and those in MMO regularly post their earnings to encourage other bloggers to exert more efforts and make more money from different online activities. In my case, I post this blog to prove to my target audience, the i-café owners, that there really exist a chance for them to make extra money if they can do blogging while watching their shops. I have written many articles in the past about blogging as an income opportunity for i-café owners. I just can’t push for it so much because you may get back to me and ask for proofs of what I am saying. But now that I have proven it to myself, I feel more confident to tell you that blogging is indeed an opportunity to earn some money on the side. A solid proof of what I am saying is the owner of Just Another Pixel who is an i-café owner herself. So what are you waiting, i-café owners? All the resources are already on your hands so try blogging now! I have my blog since 2007. But as of now, I only have $3 on my adsense account. That is because I really never thought that you could earn from blogging. I only started blogging after reading other blogs that totally doesn’t have any ads on their sites. Only learned about earning from blogging recently and I am just starting to give focus this year (and I believe I’m improving, slowly). Congrats again and may your advocacy continue to grow and influence others with the privilege of earning from blogging. .-= dodimar´s last blog ..Gumaoc Meets Chummy Chum =-. As I said, earning a small side income is only incidental in my blogging. It’s more of my intention to be a part of making i-café a better business for everybody which I believe we are making some leeway. With this proof that even a non-writer like me can make money from blogging, I am toying with the idea of organizing a seminar for i-café owners who are interested to go for it. By the way, thanks also for reading and commenting on my blogs regularly. A lot of Pinoys still have not tapped into online money-making. Some of them are still critical about how much effort is put into making money through blogging. I am not only making money through Adsense, but also through Paid Posts/Reviews on my blogs. 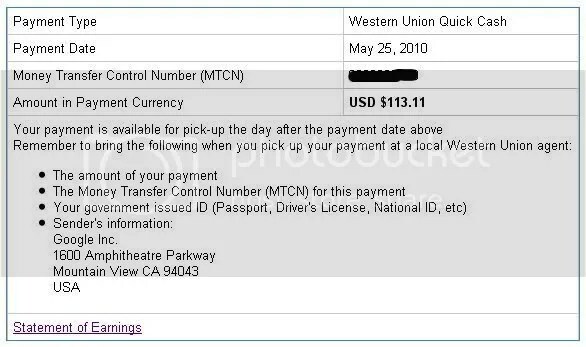 I have posted a lot of payment proofs from the different online money-making programs, including Adsense, paid reviews, and paid to click sites. I make money online while we make money offline through our internet cafe. It’s a very good way to maximize our internet connection. I hope more internet cafe owners would tap into the thousands of ways we can all make money online. Congratulations sir EdZee. Your blogging advocacy is really outstanding and I think, monetizing it a bit is a good or fair thing to do. .-= Ron Leyba´s last blog ..Make Money With Twitter =-.